In soccer circles, the home fans represent the 12th man on the pitch. From the Chicago Fire's standpoint, they had a partially direct impact toward the Fire's game-winning goal. With the smoke still clearing from some previously lit flares close to the Colorado Rapids goal, Fire right defensive back Jalil Anibaba cracked a shot from more than 40 yards out, finding the back netting during Chicago's 2-1 victory over Colorado in a Lamar Hunt U.S. Open Cup qualifying match on Wednesday at Bradley University's Shea Stadium in Peoria, Ill.
Anibaba's game-winning strike came in the 61st minute, giving the Fire a 2-1 advantage that held up over the final half hour. Anibaba's deep shot through the smoke appeared to cause a delayed reaction from Colorado goalkeeper Ian Joyce, who then scrambled to his left but could not get to the ball in time. From Anibaba's view, though, the smokey environment was not taken into account on his decision to shoot from deep. "To be honest, no, I wasn't thinking about that," Anibaba said. "I was just thinking about how much time and space I had. I got the ball played out wide, and I had a lot of time. My initial thought was to take the defender one-on-one, but I just focused on my strike and getting that on frame." With the win, the Fire will face either the San Jose Earthquakes or Portland Timbers in the qualification finals. Gaston Puerari netted the Fire's other goal on Wednesday, and Andre Akpan scored for the defending MLS Cup champion Rapids. After many weeks of speculation and floating reports across the globe, the Chicago Fire's bout against Manchester United is set in stone. The Fire face Manchester United at 7 p.m. Saturday, July 23, at Soldier Field as part of the World Football Challenge. "We are excited to host Manchester United, one of the world's finest clubs, at home in Chicago, in front of our supporters," Fire owner Andrew Hauptman said in a statement. "Bringing United to Chicago helps the Fire continue to expand our reach in one of North America's premier soccer markets. Our participation in the World Football Challenge gives our players an opportunity to take on one of the most talented clubs on the planet, while galvanizing Chicago's vast soccer community." Fire face Colorado in Open Cup: The Fire travel to Bradley University's Shea Stadium in Peoria, Ill., on Wednesday to take on the defending MLS champion Colorado Rapids in a qualifier match for the Lamar Hunt U.S. Open Cup. Kick-off is at 6:30 p.m.
Will offseason dissection pay off for Fire owner Andrew Hauptman? A losing season changes the tone of how a team conducts its business and weighs its values heading into the next campaign. That is not to say that the Chicago Fire lost sight of the ultimate goal of attempting to put together a winning club during their sub-par 2010 season. But the Fire's demeanor and the way that they have conducted things in the offseason are noticeably different. The "attractive" and "possession" lingo of last year from head coach Carlos de los Cobos and their players is less at the forefront, and the "calculated risk" approach of bringing in expensive disappointments such as Nery Castillo and Collins John appears to be gone. This year, the Fire have centered on words such as "cohesiveness" and "winning," and the idea that everybody has bought into one philosophy. Now that sounds all hunky-dory, and only the Fire locker room and front office truly know how smoothly everything is functioning behind the scenes. On the surface, the team's demeanor has to be an improvement compared to last year's disjointed team that included personality differences, style differences, injuries and fitness issues, players on the final legs of their playing careers, numerous signings that did not pan out, and a new coach who was brought in so late that he missed the 2010 MLS Combine. 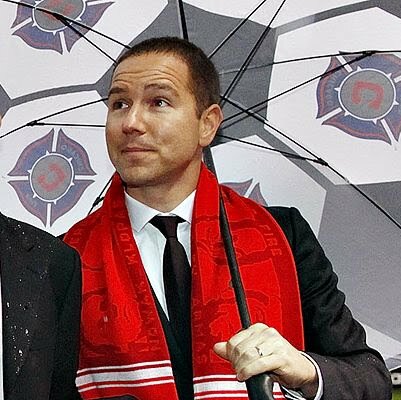 For a second straight offseason, Fire owner Andrew Hauptman and company underwent a major overhaul. Now, the question is whether the Fire feel they are ahead of last year's campaign, and if they have a functioning system in place to rebound from only their second playoff-less season in team history. 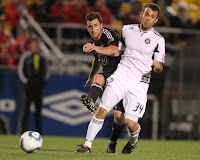 Four points and a 1-0-1 start to the 2011 season have brought some early optimism for the Fire. "I've got my fingers crossed that we've tried to do as much as we could do in a relatively short preseason," Hauptman said last Thursday. 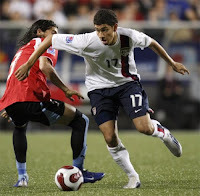 BRIDGEVIEW, Ill. -- When the Chicago Fire sought out new pieces in building their 2011 squad, they brought in a group that had a combination of athleticism, youth and experience. That might not be the easiest combination to find, but a fitting example is the addition of center defensive back Josip Mikulic. The 24-year-old Mikulic, a native of Ljubuski, Bosnia and Herzegovina, spent his previous five years with Croatian side NK Zagreb, and his game has stood out in the early going. While Uruguayan forwards Diego Chaves and Gaston Puerari will grab the spotlight if they produce a regular scoring punch, it will be Mikulic's role in the back that turns out to be just as important. Chicago has started its season with a 1-0-1 mark, and the Fire defense held most teams at bay during the preseason. The solid start has been anchored by a brand-new back line of Mikulic at center back, rookie Jalil Anibaba at right back and Cory Gibbs on the left when the Fire go with their 3-5-2 system. "I played five years in Europe, and in my country, when you switch one guy, it's a problem," Mikulic said. "[The Fire] switched the whole defense, and it's been very good." Fire coach Carlos de los Cobos accompanied technical director Frank Klopas in scouting Mikulic this offseason, and De los Cobos has been impressed with what Mikulic has brought to the table. "He has a strong personality and he's very strong on the field," De los Cobos said. "He's playing very well together with Cory and Jalil. The most important thing is he's very honest on the field. I think we are lucky to have this guy with us." BRIDGEVIEW, Ill. -- Last year's .500 record at home was a glaring problem that the Chicago Fire wanted to fix this season. It got off to a good start on Saturday. Diego Chaves scored his second goal in as many games, and Gaston Puerari and Marco Pappa also added scores as the Fire defeated Sporting Kansas City, 3-2, in front of a crowd of 12,157 at their home opener at Toyota Park. "In the past, we haven't won our first game at home, and that didn't set the tone," Fire midfielder Patrick Nyarko said. "We feel like we've set the tone for the remainder of the season, and teams that come in here, we're going to try and make it a fortress." Pappa's 59th-minute goal proved to be the game-winner for the Fire (1-0-1) as he maneuvered through four Kansas City players and slotted the ball toward the lower left side of the goal for a 3-1 lead. "I saw Diego running [nearby], but as I had the ball in front of me, I shot," Pappa said. "I'm happy with my goal. I wanted to score today." BRIDGEVIEW, Ill. -- The two MLS teams that were atop last year's playoff-less panel square off this Saturday as the Chicago Fire host Sporting Kansas City at Toyota Park. Sporting K.C., previously known as the Wizards, ranked ninth last season with 39 points, and the Fire had the 10th-best points total last season with 36. Not only did the postseason evade the Fire last season, but Chicago also hopes to turn around a lackluster 4-4-7 record at Toyota Park during the 2010 campaign. Sporting K.C. (1-0-0) presents another strong offensive challenge for the Fire (0-0-1), who were able to fend off 2010 MLS runner-up FC Dallas last week with a 1-1 draw on the road. Kansas City sports an attack that features Omar Bravo, Kei Kamara and C.J. Sapong, a tandem that had some part of every goal during its 3-2 road win over Chivas USA to open the season. Bravo had two of the three goals. "These guys are very similar [to Dallas]," Fire head coach Carlos de los Cobos said. "Bravo is more of a forward and he doesn't drop too much. Kamara is very fast. And Sapong is a strong guy -- very young, but very strong." "It's going to be a bit similar in terms of Dallas attacking with so many numbers," Fire defender Cory Gibbs said. "But the thing is Dallas attacked way more than what I think Kansas City will. They're going to be a threat still. So I think if we stay positive and stay organized defensively, we'll have our chances countering against that." The Chicago Fire signed 22-year-old forward and former U.S. U-20 international Gabriel Ferrari on Thursday. "During Gabriel's time in camp, we were impressed with his size, speed and work ethic up top," Fire technical director Frank Klopas said in a statement. "His experience abroad and desire to be a part of this club were defining factors in us signing Gabriel." 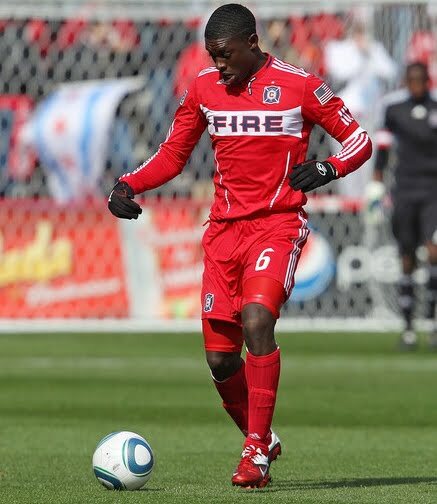 BRIDGEVIEW, Ill. -- The Chicago Fire added some new pieces to the puzzle on Wednesday with the acquisition of forward Dominic Oduro and Colombian defender Yamith Cuesta. 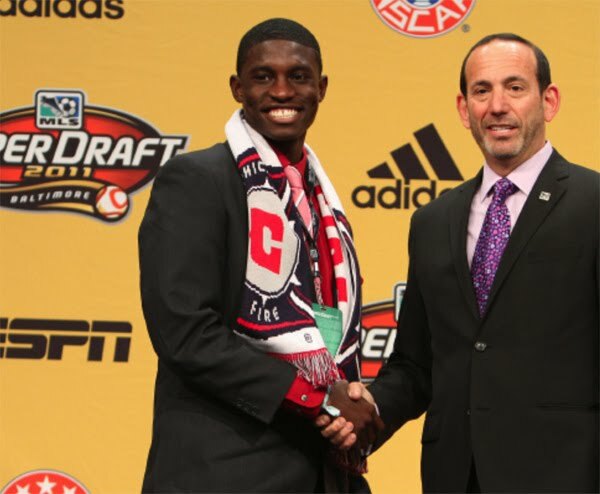 The Fire sent a 2012 MLS Supplemental Draft selection to Chivas USA for Cuesta's rights. And Chicago sent forward Calen Carr, a 2006 draft pick who spent his first five MLS seasons with the Fire, to the Houston Dynamo for the 25-year-old Oduro. Carr missed last weekend's 1-1 draw against FC Dallas because of a concussion. 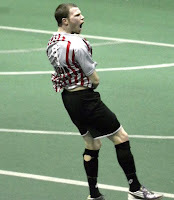 Chicago Riot forward Alex Megson was named to the 2010-2011 Major Indoor Soccer League All-Rookie Team on Tuesday. Megson tallied nine goals, two assists and 20 points in 18 games. Five of his goals came during the Riot's final five matches. 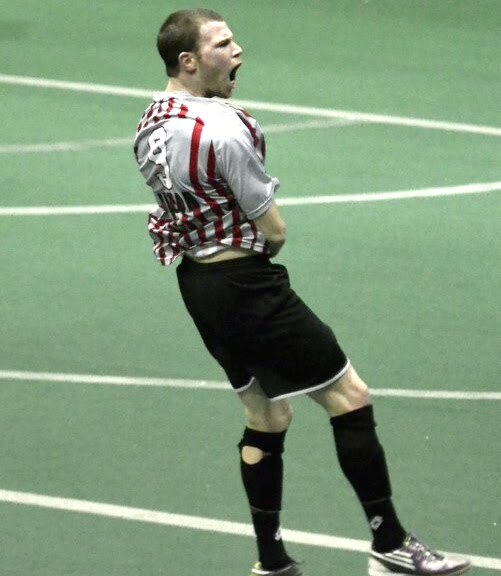 Chicago Riot forward Bato Radoncic was named to the 2010-2011 All-Major Indoor Soccer League First Team on Monday. 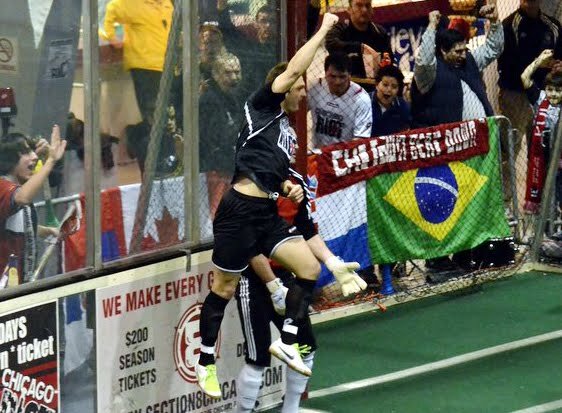 Radoncic led the Riot with 49 points and was a three-time MISL Player of the Week selection this season. 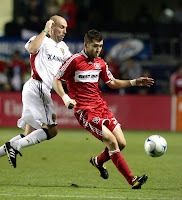 The Chicago Fire handled 2010 MLS runner-up FC Dallas with composure in their season opener, earning a 1-1 draw on Saturday in the first leg of the Brimstone Cup at Pizza Hut Park in Frisco, Texas. Uruguayan forward Diego Chaves netted his first MLS goal for the Fire as both teams scored within the first 20 minutes. The Fire, who regularly were handed red cards during the preseason, actually benefited on Saturday with Dallas defender Brek Shea getting ejected in the 55th minute. Though the Fire could not get the go-ahead goal while up a man for most of the second half, getting a road draw against a tough Western Conference squad was a satisfying beginning to the 2011 campaign. "Sometimes you tie and don't feel very good [about the result], and sometimes you tie and feel like you win," Fire head coach Carlos de los Cobos said. "At the end of the game, I am not very happy about the result, but I am happy about the effort of the players." BRIDGEVIEW, Ill. -- One year ago the Chicago Fire had a vision of attractive and possession-driven play as its successful model. After a trying 2010 MLS campaign that resulted in a sub-.500 record and a rare shortened season outside of the playoff picture, the Fire are hoping the implementation finally comes to fruition this 2011 season. 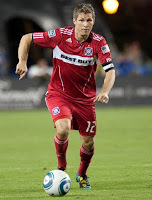 The new-look Chicago squad travels to Frisco, Texas, on Saturday to take on 2010 MLS Cup runner-up FC Dallas. "We've obviously had quite a bit of changes coming into the year, but that's normal -- maybe a few more than usual," Fire captain and defensive midfielder Logan Pause said Friday following training. "But guys have come in and done their job to help move this thing along, so this weekend's a test for us and we're looking forward to it." Last year's Chicago Fire squad was a middle-of-the-pack MLS team on the offensive end, scoring 37 goals in 30 games. But there were many dry spells along the way, as the offense was shut out seven times during the final two months and 10 times overall in 2010. There were moments of strong possession, but the finishing was lacking, as was the cohesiveness from line to line. Since last October, many of last year's Fire players have moved on. Arlington Heights native and U.S. Soccer legend Brian McBride retired. McBride's former Fulham teammate Collins John, who albeit had a disappointing three-goal showing, was released and latched on to Gabala FC. And in the midfield, the Fire lost some production now that Freddie Ljungberg (Celtic), Peter Lowry (Portland Timbers) and frequently injured John Thorrington (Vancouver Whitecaps) have departed. This season the Fire signed a pair of Uruguayan forwards in Gaston Puerari and Diego Chaves, who have had only several weeks to get acclimated to the new club. Puerari saw more preseason action than Chaves, who had one of his matches shortened by a first-half red card. "Diego is a very good player," Fire midfielder Baggio Husidic said. "Even though he might not look big, he's big on the ball. He's quick. He's not a typical No. 9. I'd say he's more of a 10, where he drops and gets the ball, plays it through the middle, attacks, and he's good one-on-one and good at passing. Gaston is more of a speedy player. He's really cheeky on the ball. They both complement each other. They kind of drop in and play like midfielders almost." The Chicago Fire officially signed midfielder and 2011 third-round selection Davis Paul on Thursday. "We've been pleased with Davis' skill, effort and attitude on and off the field," Fire technical director Frank Klopas said in a statement. "Davis is a creative player and a strong competitor, with the ability to play up top and on the wing." The Chicago Fire defense went through a complete makeover following last season, with a new scheme and a new cast of characters. Veteran Cory Gibbs, Josip Mikulic and rookie Jalil Anibaba are the projected defensive starters from left to right within this year's new three-back system. And considering the lack of goals Chicago allowed during the preseason (the Fire allowed only one goal in three games at the recent Carolina Challenge Cup), it appears that things have meshed quickly within the back line. "No one would have expected, the way it's been so far," Gibbs said. "But then again, this is preseason. The numbers that have happened aren't going to count for anything, and we just have to translate into the regular season." Last year's rookie class eventually played some important roles for the Fire on the defensive side, with Sean Johnson earning the No. 1 goalkeeper spot and defender Steven Kinney establishing himself at right back. But as Kinney recovers from an Achilles injury he suffered at the end of last season, 2011 first-round selection and University of North Carolina product Anibaba is quickly cementing his presence in the lineup. "You never know what you're going to expect when a rookie comes in," Gibbs said. "College is a completely different game. But Jalil is an exception. He's a talented athlete, a talented figure on the field. And what makes him exceptionally great is that he wants to learn. Day-by-day he's progressing and he'll shoot right in. It's not something with him that's going to take time. It seems natural." Ante Cop's winner: The reaction says it all. I'm prone to doing things at the last minute like anyone else. But the Chicago Riot's birth into the Major Indoor Soccer League was taking it a bit far. 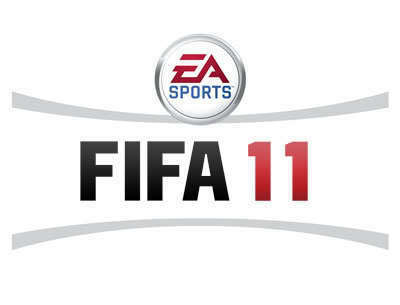 Starting a professional soccer team in a matter of weeks? Talk about a challenge! But the word "impossible" never crossed my mind as I knew we had the right people running the ship. My first involvement with the team -- I guess you could call it a job interview? -- originated with Peter Wilt in the Toyota Park parking lot on Oct. 16, 2010, before I had to cover Chicago Fire forward Brian McBride's final home game for an ESPN Chicago article. Ten days later, we held our introductory press conference (thanks for the great turnout!). And several weeks after that, on Nov. 19, the Riot went on the road to Baltimore for its first MISL game. 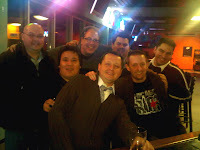 The Riot crew after our home finale. With hardly any preparation, this Riot squad put together a season that the team and its fans should be proud of. It didn't result in a postseason berth, but under these circumstances, I'm amazed at what the Riot was able to accomplish. And it was a thrill to be back in the indoor grind in a unique setting at the Odeum Sports and Expo Center in Villa Park. The Odeum has that Hickory Huskers feel to it like "Hoosiers." The game-day activities and events also were old-school and entertaining. The Riot's version of Bozo Buckets brought back the days where I wish I could have won a Radio Flyer wagon. Chicago Soccer Heritage Night was fantastic, running into the folks who were trend setters of this sport in Chicago, and seeing memorabilia, photos, articles and more from several decades back. • 5. Cop saves the day (Jan. 16, 2011): Let's face it ... Ante Cop is showing up on several occasions with this list. Cop had 22 saves on this date, and his final save came at the final tick of the clock. The Riot, carrying a two-point lead, made a poor mistake with a three-line pass with 2 seconds remaining in the fourth quarter, putting the ball at the top of the arc for the visiting Baltimore Blast. Baltimore took the free kick and Giuliano Celenza had a clear path with his strike from the left side. 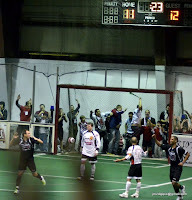 Cop dove to his left and batted the ball away to give Chicago its first home win at the Odeum, 14-12. • 4. Bato heats up (Feb. 6, 2011): Bato Radoncic had a February to remember. He was the league's top scorer in the month (10 goals, 22 points), though he lost out to Missouri's Byron Alvarez for player of the month honors. Radoncic's offensive prowess shined to the fullest on Feb. 6, as he tallied the first hat trick (four goals, actually) in Riot history during Chicago's 16-12 win over the Missouri Comets. Two tallies came during the Riot's critical 8-0 run in the fourth quarter. • 3. First win in the books (Dec. 19, 2010): The Riot's 0-4 start to the season was a bitter pill to swallow, simply because Chicago lost three of the four games by four points or less. But the Riot finally broke through with a 14-13 road victory over Missouri. The Comets did have a chance to take the game at the end, but Jeff Richey made a clutch diving stop to his left with about 3 seconds left on the clock to preserve the win. • 2. Cop, Richey rise in OT (March 4, 2011): The mathematical playoff scenarios were already in the rearview mirror, but the Riot fought to the very end in becoming the first team this season to hand Baltimore two defeats. The 11-9 win was capped off by an Ante Cop goal in overtime. Cop didn't get much playing time in the forward role in this match, but he made the most of it with a goal at the 2:11 mark of OT to complete a 6-0 run, ruining the Blast's chance to clinch the regular-season title. Cop shouldn't take the full spotlight, though. 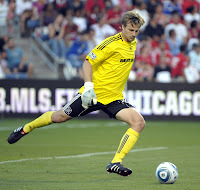 The Riot would not have even been in this position if not for the play of goalkeeper Jeff Richey, who posted a game-high 19 saves and kept Chicago in the match. Richey had plenty of critical saves, including a late one in regulation against Giuliano Celenza, who was honored for his career before the match -- Celenza's retiring at the end of the season. The Riot soured the Blast's day on many levels. • 1. Thrilla in Villa (Jan. 16, 2011): Ante Cop earned a little national acclaim with this strike, which appeared on ABC's "Winners Bracket" show. With 23 seconds remaining and a one-point deficit, Cop unleashed a left-footed strike from a few feet inside the midfield stripe, found the upper right corner of the net and the Odeum went crazy. Chicago Riot 14, Baltimore Blast 12. The reactions afterward were priceless -- Riot head coach Jeff Kraft practically doing an Arsenio Hall "woof! woof!" impression; injured goalkeeper Jeff Richey hobbling with a bad hamstring but lifting up Cop in celebration during the Blast's timeout; and of course the growing contingent of Riot rebel rousers at the east end behind Blast goalkeeper Nick Hovaker. Cop's goal will remain one of the most memorable strikes in indoor, and I don't think I'm being overly dramatic in saying so. With only two seasons under his belt, Chicago Fire midfielder Baggio Husidic has stepped in comfortably following his University of Illinois-Chicago days. The 2009 draft pick and Libertyville High School alum earned regular minutes in his second season last year, posting 18 starts in 22 games. Husidic tallied five goals, ranking third on the club. And more will be expected from Husidic in his third campaign. "Personally, I think I've progressed quite a bit," Husidic said. "Last year I sat on the bench coming from preseason and early in the season. So this year I've fought for a starting spot and thus far have been in the first 11. I'm hoping that the confidence keeps growing and I keep improving." 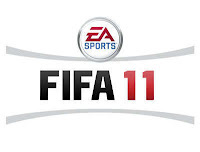 EA Sports conducted a simulated 2011 MLS regular season using EA Sports FIFA Soccer 11 on PlayStation 3. The results, released Tuesday by EA Sports, have the Chicago Fire finishing last in the Eastern Conference with a 7-6-21 record and 27 points. There was some unfamiliarity among fans and even media folks attending the Chicago Fire's 2011 season kickoff luncheon on Monday at the Hyatt Regency in downtown Chicago. Just who are some of these Men in Red? It is a natural reaction even if you have wholeheartedly attempted to keep close track of the Fire's offseason. After missing the postseason for only the second time in the team's history in 2010, Fire technical director Frank Klopas and company went to work as half of last year's squad was not in the blueprint for this upcoming season. Klopas described on Monday how the team's retooling process spanned across "four continents and 12 countries -- more than all other offseasons combined over the club's 14-year history." Fire fans soon will find out if Chicago's technical staff put together the right pieces when the team plays at FC Dallas on Saturday to open the 2011 MLS campaign. "The time between our final match on Oct 23 last year and Jan. 28 when the players reported for training camp was busier than ever for myself and the technical staff, as we took an analytical and rigorous approach in how we could change things heading into 2011," Klopas said in his address to more than 750 luncheon attendees. "The offseason work was a necessary step in improving our squad that achieved results below the standards we expect here in Chicago." The Chicago Fire's preseason slate has wrapped up, and yet this team still is a mystery on several levels. Four straight preseason games with a red card -- the latter three resulting in 10 men remaining on the pitch -- did not help Chicago's evaluation process. Ultimately, we are left wondering where this club stands from a cohesive and tactical perspective. And the Fire's 2011 MLS opener is only days away as they travel to Texas to take on FC Dallas on Saturday, March 19, at Pizza Hut Park. The Fire's first team posted a 1-2-3 preseason record, earning a 1-0 victory over Toronto FC on March 5 for its lone win. Visit ESPNChicago.com for the Fire's preseason wrap-up. For once in the Carolina Challenge Cup, the Chicago Fire did not have to deal with a man disadvantage situation during Saturday's finale of the tournament. But despite numerous chances on the offensive end, Chicago came up empty as the Fire played the host Charleston Battery to a scoreless draw at Blackbaud Stadium in Charleston, S.C.
During a crazy 9-minute stretch in the first half of the Fire's match on Saturday, three players were ejected. The Battery's Stephen Armstrong (30th minute) and Mark Wiltzee (35th minute) were shown straight red cards, and the Fire's Mike Videira received a second yellow card and ejection in the 38th minute. But Chicago could not find the back of the net despite a 10-on-9 advantage on the pitch for much of the game. 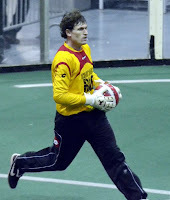 Former Fire goalkeeper Andrew Dykstra (pictured), who recently joined the Charleston squad, maintained a second-half clean sheet. Charleston's Keith Wiggans manned the Battery net in the first half. Orr Barouch's four-goal performance against the New York Red Bulls reserve team represents the Chicago Fire's standout accomplishment of the preseason. 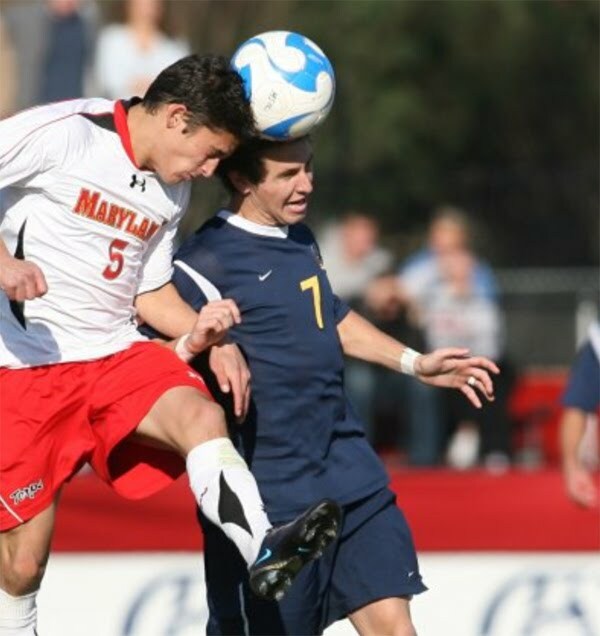 Chicago rewarded the 19-year-old forward, as well as midfielder Mike Videira, as the Fire signed the duo on Thursday. Videira is immediately added to the roster, and Barouch will shortly follow upon receipt of his International Transfer Certificate. "Orr and Mike are young, talented players who bring versatility to our lineup and are able to play multiple positions," Fire technical director Frank Klopas said. "Both guys are driven to succeed at this level and will help in the progression of our club." 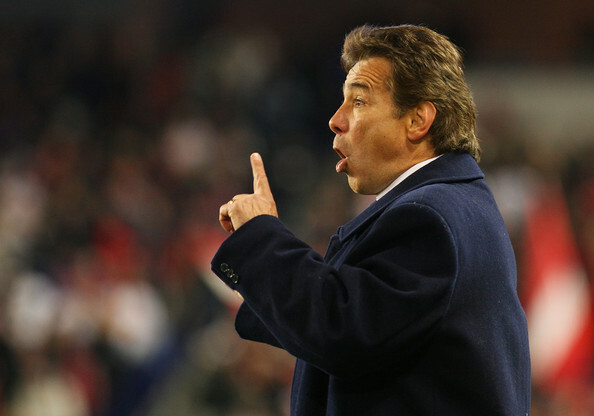 For a team hoping to get a look at its offensive options heading into the 2011 Major League Soccer season, the continual red cards are not helping the Chicago Fire's cause. Uruguayan forward Diego Chaves was ejected in the 37th minute and the Fire fell to D.C. United, 1-0, on Wednesday at the Carolina Challenge Cup at Blackbaud Stadium in Charleston, S.C.
D.C., which defeated the host Charleston Battery last week, is in good shape to repeat as Carolina Challenge Cup champion with two wins and six points in the bag. Chicago has three points from last Saturday's 1-0 win against Toronto FC and faces Charleston and potentially former Fire goalkeeper Andrew Dykstra, who just joined the Battery squad, this Saturday to wrap up the tournament. On Wednesday, Chaves' red was Chicago's second straight in the tournament (third straight in preseason action) as defensive midfielder Logan Pause was issued a red during last Saturday's win over Toronto. Pause returned Wednesday as the tournament does not issue a one-game suspension. "It makes for a difficult game of soccer to be played. That's the reality," Pause said of the team's recent shorthanded situations. "You take positives and negatives out of it. The positive is a situation like this helps build character and requires a team to roll up its sleeves and hope to get a result. We have another match this weekend and we've done a lot of training in our system, so we feel we're in good shape." INDEPENDENCE, Mo. 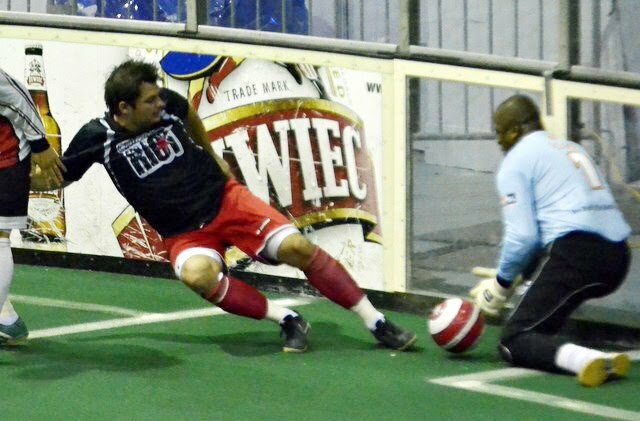 -- The Chicago Riot fell to the third-place Missouri Comets, 18-12, on Sunday to wrap up its inaugural Major Indoor Soccer League season at the Independence Events Center. In a losing effort, Riot scoring leader Bato Radoncic tallied three goals and an assist, and goalkeeper Jeff Richey made 20 saves to surpass 900 for his career. Richey now has 904 career saves. Chicago overcame a 10-2 halftime deficit to tie the score at 10-10 through three quarters. But the Comets pieced together another 8-0 run to seal the victory, with two of Missouri's final scores coming when the Riot had a sixth attacker on the field. "We were down, 10-2, and the boys came back and fought tonight," Riot Head Coach Jeff Kraft said. "I hate pulling the 'keeper, and we got burned in the end. But I'm proud of the boys. And give the Comets credit, they stepped up and could be going to the playoffs. They're peaking at the right time." The Riot wraps up its first MISL season with a 5-15 mark, while the third-place Comets improve to 8-11 as they attempt to secure the third and final playoff spot. For more about the Riot, visit ChicagoRiotSoccer.com. Though it was not by design, the Chicago Fire's opening game of the eighth annual Carolina Challenge Cup against Toronto FC turned into a strong preseason test. Marco Pappa netted the game's lone goal and Chicago played down a man for about 55 minutes and hung on to a 1-0 win over the Reds on Saturday in Charleston, S.C. The Fire had to abandon their new three-man defensive line early as captain and defensive midfielder Logan Pause was issued a straight red card in the 36th minute for a two-footed challenge against Toronto's Oscar Cordon around midfield. But Chicago already had its lead and the defense held up en route to the shutout. Pappa tallied his third goal of the preseason in the 6th minute on a well-executed sequence. Gaston Puerari provided the cross from the right side to Davis Paul, who then dropped the ball back to Pappa who darted into the box for the finish and the 1-0 lead. "I got toward the left post and could have taken a shot, but I saw Marco coming in," Paul said. "I passed it back to him and he had a class finish." BALTIMORE, Md. 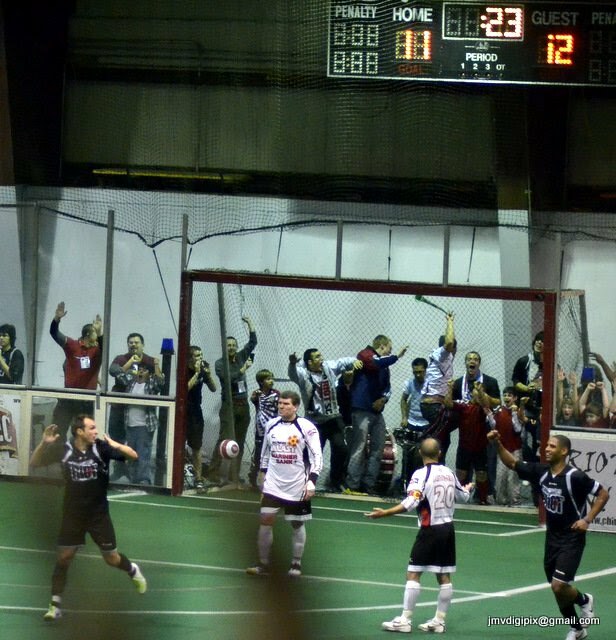 -- For the second time this season, the Chicago Riot's Ante Cop scored a game-winning goal against the Baltimore Blast as Chicago earned an 11-9 overtime victory Friday in Major Indoor Soccer League action at 1st Mariner Arena. The Riot (5-14) ended a four-game losing streak and became the only team in the league to defeat Baltimore (14-4) twice this season. Chicago's win also prevented the Blast from clinching the MISL regular-season crown and ended Baltimore's eight-game winning streak. "It's about time for these guys. We've come up many times on the short end of close games, and they never stopped fighting, especially for the city of Chicago," Riot Head Coach Jeff Kraft said. "We've been through a lot, but they know what it's all about. It was a good win all around, and the guys stepped up offensively and defensively." Cop tallied the game-winner at the 2:11 mark of overtime with a quick turn in the box as Blast goalkeeper Sagu could not come out in time to prevent the attack. Cop has scored three goals this season. Cop's other game-winner was when he was in a goalkeeper/sixth attacker role, netting a three-pointer with 23 seconds remaining to beat Baltimore, 14-12, on Jan. 16 at the Odeum Sports and Expo Center in Villa Park, Ill.
Also noteworthy Friday was Riot goalkeeper Jeff Richey, who kept Chicago in the match with a game-high 19 saves. Starting lineups, positional changes and formations sometimes need to be taken with a grain of salt during the preseason. 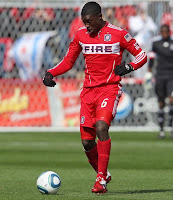 But the Chicago Fire certainly appear to be set on their ways with a new 3-5-2 formation heading into their 2011 campaign. The three-man defensive back line is a dramatic variation for many of the players on Chicago's roster. The person most affected by the new scheme is typical left back Gonzalo Segares, who adjusts to a midfield role this year. For the moment, it appears that the Fire's starting back line will consist of Cory Gibbs, Josip Mikulic and rookie Jalil Anibaba from left to right. Segares is now pushed up to the left side of the midfield alongside Marco Pappa. "I'm starting to like it a little better. I'm getting used to it," Segares said of the position switch. "I'm not used to receiving the ball with somebody on my back, so there are different things to get used to in this position. There's a lot more running, and I'll be one of the fittest guys on the field when we're done with preseason. I like the challenge. I like to push forward and help the team that way, and I can still help Cory on that left side." © 2013 Slide Tackles Communications. Awesome Inc. theme. Powered by Blogger.